Here is a tough to find sword! It is a nice original Civil War sword with a beautiful hand guard! It is an original Civil War foot officer's sword. This is the classic style carried by the line officer's of the Civil War. This one has the full-length at 30-1/2 inches. The blade has a light dove gray tone with a pretty look. You can still clearly see the original etching on each side of the blade. On the front side it has the eagle still visible as well as the pen etched "E PLURIBUS UNUM" motto. On the back of the blade it has the block letter style "US” marking. On the base of the blade you can still see the etched maker’s mark from the famous Ames Company of Chicopee, Massachusetts. Ames was the largest maker of Civil War military swords and after looking at their quality products like this one you can see why. This however is a very tough to find version of this sword. 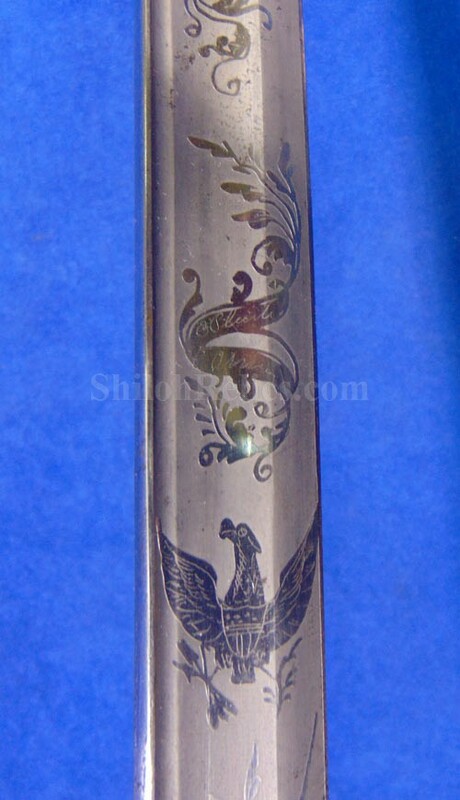 At the base of the blade it has the stamped date of "1862" as well as the "US" stamp and the "JH" initials. These initials are those of the inspector that approved the sword for Government purchase, J. Hannis. Thillmann's sword book states that there were only 575 of these swords purchased and delivered by the Government in 1862. The sword has the original hand guard and pommel cap intact. This sword is very high quality and it still retains a very fine amount of the gold gilding on the brass. The hand guard has the floral design that denotes the foot officer status of the soldier that would have carried it. On the grip of the sword it has the original sharkskin grip intact. The handle has the original double strand of brass wire present around the grip. The sword is accompanied by the original leather and brass scabbard. The body of the scabbard is the version made of fine black bridle leather. It has both of the brass rings and mounts intact. The original throat is intact at the top of the scabbard and on the bottom of the scabbard it has the drag. 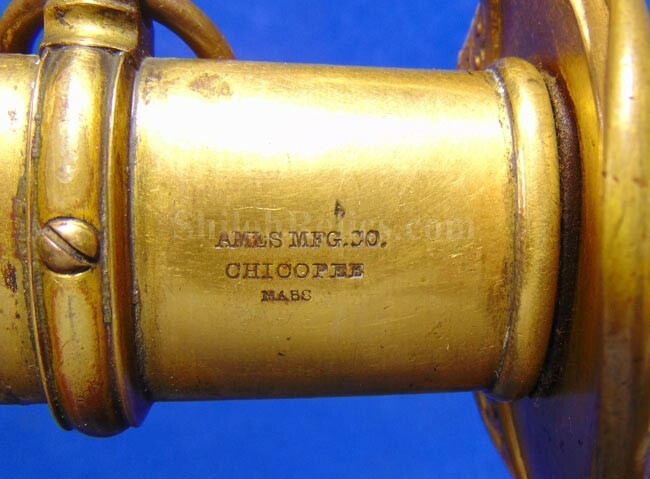 The scabbard is an Ames product and has their maker's mark and location stamped into the back side of the top mount. 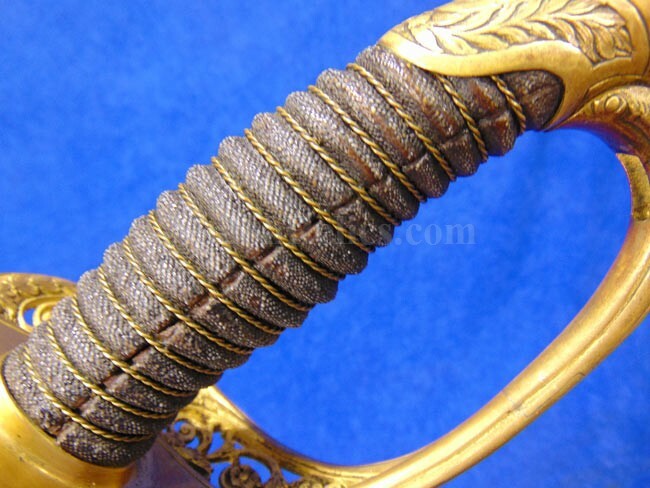 This is a beautiful sword from the Civil War from the famous Ames Manufacturing Company and is one of only 575 purchased by the US Government.